Before diving into practical demonstrations, let’s understand few concepts about docker containers. 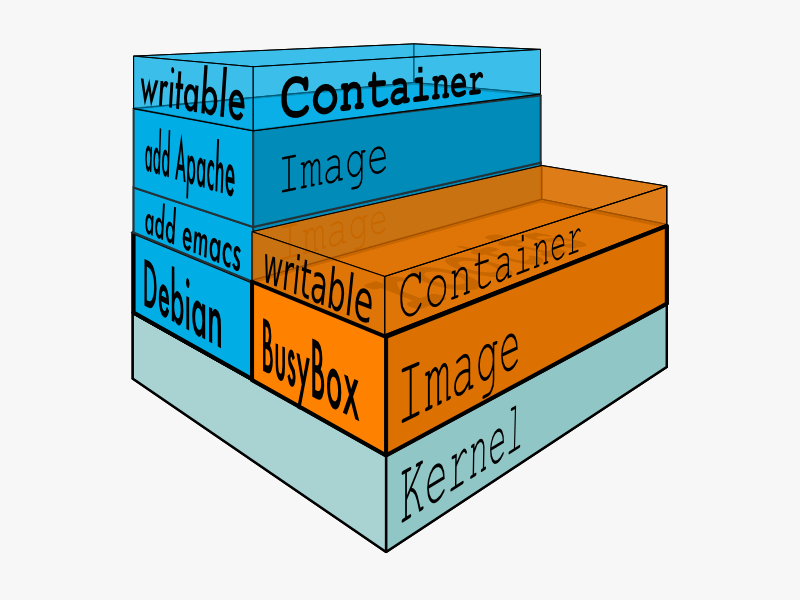 Containers are sandboxed environments which run multiple processes sharing the same host kernel. Containers are created from docker images.Images use a layered AUFS filesystem. An image can contain multiple layers. Layer 0 is called the base image. All the layers in an image are read-only except the topmost layer. The writable layer can be called as a container. You can commit the changes made to a container and make a new image out of it. All the layers will be preserved and you can make it a parent image to create containers. Each container has its own network configurations and unique id (64 hexadecimal digits). When you create a container, if the specified image is not present in the host, docker will download it from the docker hub (public image registry maintained by Docker Inc). Following are the important docker commands which are used for creating and managing containers. “docker run” command is used to run containers. This command accepts various argument. You can list all the supported argument by executing “docker run –help” command. Explaining all the arguments used by this command is out of scope of this article. The following “docker run” command launches a new container from busybox image and creates an interactive session in the container. busybox:latest: The image you are pulling has been verified. Important: image verification isa tech preview feature and should not be relied on to provide security. If you see the output of the command, Docker was unable to find the image specified in the command in the host. So it pulled the image from the docker hub. “-i” flag in the command is used for starting an interactive session for the container (Keeps the STDIN open). “-t” flag attaches a pseudo tty. “–name” is used for naming the container. Here we named our container as “testcontainer”, “busybox” is the name of the image. Once the command is executed, Docker created the container and started an interactive session. The output shows the list of files in the container using “ls” command. To exit the container just type “exit” command. When you exit out of the container, the container stops running. To keep the container running, you need to run the container in daemon mode using “-d” flag as shown in the command below. Also, you can use the “–restart” flag in the docker run command, which restarts the container whenever it stops or fails. Command for creating container with restart flag is shown below. This command lists all the containers in the host. Let’s have a look at few examples. The following command lists all the containers. To list all the running container, use the following command. To list all the containers which got launched recently, execute the following command. This command stops the running container. This command starts a stopped container. This command restarts a running container. This command is used to get an interactive session of a running container. Let’s say, you want to get a bash session or you want to modify some file and configurations in a running container, you can make use of the attach command. If you exit the container using “exit” command or ctrl + c, the container will stop running. To detach the container by leaving it running, you need to use cntrl +p and cntrl +q commands. This is the another way of getting into containers shell. Using the exec command, you can get the shell session of a running container. One advantage of the exec command over attach command is that, when you exit the container, it will continue in the running state unlike attach command. This command gives you all the logs of a container. This command gives you all the information about a specific container. The output of this command is in JSON format. To get a specific detail of a container, like the IP address of a container, you can use the inspect command with few options as shown below. This command is used for renaming a container. It takes the following form. Using this command, you can remove the containers from host. To do this, you need to stop the running container first and them remove it using the rm command. If you want to remove a running container without stopping it, you can use the “-f” force flag with the rm command as shown below. You can also use one-liners, which will stop and remove all the containers from the host.